Blue bottle jellyfish, also known as Portuguese man-of-war, tend to come to the shores for reproduction during mid-monsoons in Mumbai. Scores of blue bottle jellyfish spotted across the beaches of Mumbai have attacked more than 100 people at Juhu and Aksa, causing panic and fear among the people. People who were stung by the blue bottle jellyfish reported redness of the affected area and prolonged pain. 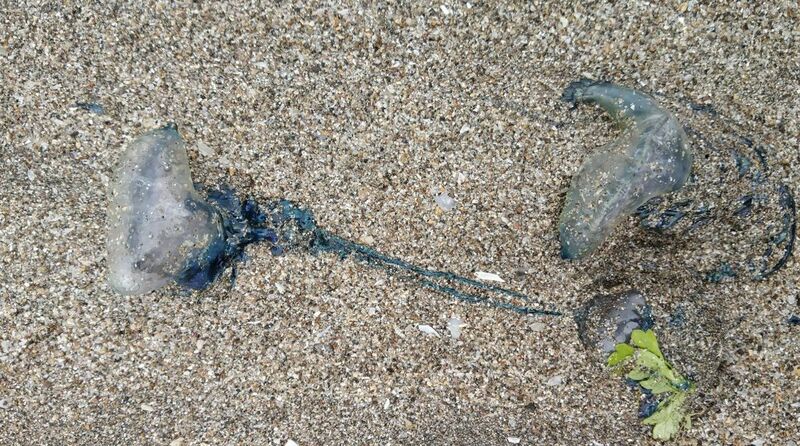 It is known that the venomous sting of the blue bottle jellyfish can kill fish but not humans. The sting causes itching and pain for hours. Some shopkeepers tried to help the people by rubbing lemon on the affected area for some immediate relief. People have been advised to avoid beaches for some days. Blue bottle jellyfish, also known as Portuguese man-of-war, tend to come to the shores for reproduction during mid-monsoons in Mumbai. This year, they have been spotted in large number as compared to previous years. “The jellyfish stings the person who comes into its contact. It causes physical pain and that body part becomes red. There may be deafness or that particular part becomes numb. Some vinegar and hot water should be poured on the affected part,” State Commissioner for Fisheries Arun Vidhale said. The Maharashtra government has also cautioned people against visiting beaches where blue bottle jellyfish were spotted.